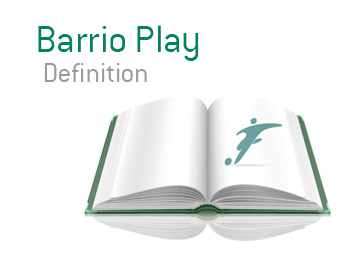 Barrio Play Definition - What Does Barrio Play Mean? What is the meaning of Barrio Play in the game of football. Barrio in spanish means neighborhood. Barrio play refers to the way South Americans play football in the streets. In comparison to the football we see on TV, which is regulated more heavily by the day it seems (goal line technology, additional referees, cameras everywhere etc. ), barrio style is rougher and more ruthless. Players get away with more on the pitch. The way native Brazilian Diego Costa plays is a perfect example of barrio style. Costa did not attend a football academy in his youth. He learned his trade by playing in the streets. Even now playing in the English Premier League the remnants of Costa's roots are highly visible. He is rough around the edges, uses brute force to complement his skills and he is no stranger to altercations and provoking players of the opposing team. A bad example of barrio play of course is the infamous Jara provocation of Cavani at the Copa America 2015 in Chile.